Another gem of gems! This hike is terrific, and so very easy. 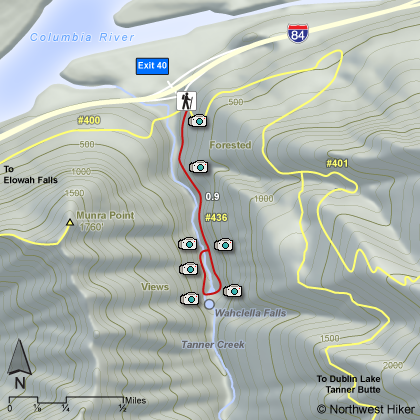 Start at the Wahclella trail head parking lot and walk along a service road parallel to Tanner Creek for about a quarter mile. In the fall you can see the salmon in this stream. As you continue on your hike, you will gently begin to climb. In about a 1/2 mile you will come to a junction where the trial loops, using two excellent bridges to provide you the opportunity to view the falls and canyon from both sides of Tanner Creek. 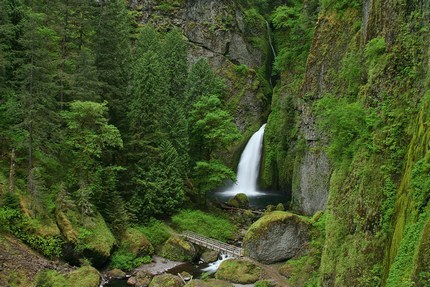 If you bear left, after about 3/4 miles you will begin to descend right to the base of Wahclella Falls. You can continue across a bridge to gain additional views of this wonderful waterfall and the little gorge that it is in. You will then cross that 2nd bridge and the trail will loop back to the junction that you passed earlier.